The excellent English violinist Tasmin Little has decided to give up the grind after 30 years on the road. My performing career has taken me to every continent of the globe, to most of the major concert halls with a wondrous array of international orchestras and incredible conductors. For three decades, I have enjoyed very special partnerships with Piers Lane, Martin Roscoe and John Lenehan. I have given hundreds of presentations in schools and have had opportunities for 10 years to visit numerous small communities far and wide with my Naked Violin Project, forming connections that have often been exceptionally touching and truly special. I have made over 40 commercial recordings, appeared on a huge quantity of television programmes, made documentaries for TV and radio, presented radio programmes, been the Artistic Director of two festivals, written countless articles for magazines and newspapers, and given something in the region of 1000 interviews across all forms of media. And, I have enjoyed every moment of it and treasured all the opportunities that a life in music has given to me. I have loved every moment, but now it is time for me to embrace a new perspective and relish new challenges and opportunities. Wow. What a bold decision. It makes sense the way she explains it. One can only wish her great success in the next stage of her stellar career. Superb musician and lovely human being. She’ll be missed on the circuit. She looks like she can afford it in the picture. Hellooo, what happened to British humour and sarcasm? Braking away from it too? I don’t know what happened to it. I’m not British. 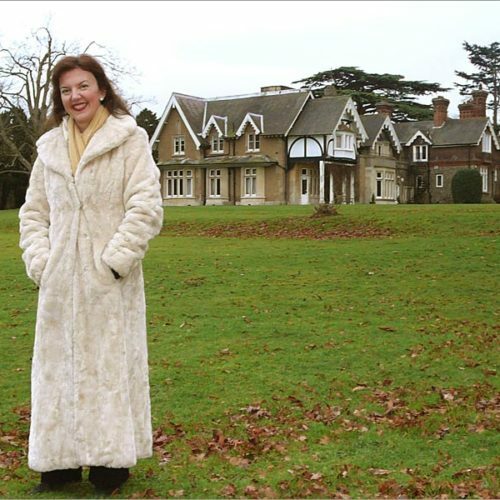 Hi Tamino, I’m wearing fake fur and the building is at the Yehudi Menuhin School, my old school ..
You do realise that that’s the Yehudi Menuhin School, not her house? That’s the Menuhin School behind her.